Love these chairs. They clean easily and are very comfortable. They are a statement piece around my dining room table. Very happy with the purchase and would recommend to anyone who is looking for a statement chair for their dining room table. 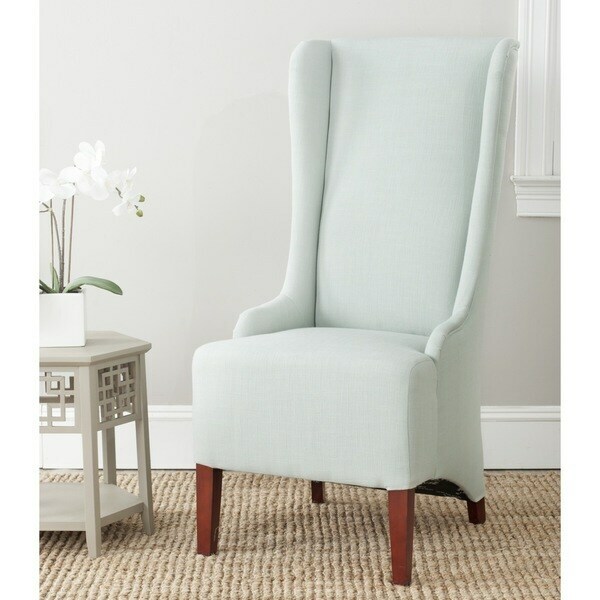 The Bacall high back chair absolutely commands attention in sea foam green cotton fabric and cherry mahogany finished legs. With a reaching, slightly tapered backrest and sloping arms, the dramatic Bacall is all about smart sophistication. It is a true mint/seafoam green. Fabric looks to be a nice woven-type (almost like linen, but softer). Chairs are firm, they do not have a lot of 'seat' for oversized folks (I am 5'6" and 165lb and it's great, if I were 20lb heavier it might be uncomfortable). Goes perfectly with this rug: Safavieh Handmade Dip Dye Green/ Ivory Grey Wool Rug (9' x 12'). 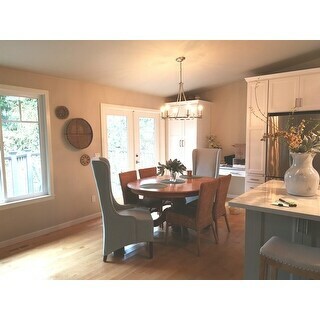 Chair is definitly a great high-back chair for the table-head's....made a perfect dining room with these chairs & Kosas Home Nova Side Chair in Camel + Kosas Home Winfrey Dining Table. Beautiful chair! Nice and tall and subtle seafoam color as pictured. Comfortable...used as a desk chair. Exactly what I was looking for! Pretty seafoam color. I agree with other reviewerd in that they are very comfortable. They arrived fully assembled and on time. Tiny knick to one chair leg upon arrival, but not noticeable and well-packaged. I really like the style of this chair, as well as the fabric and especially the color, which is unusual... however I wish the upholstery was higher quality. Odd wrinkles here and there at fold areas and the legs were a bit scuffed up, probably from rough handling. For those reasons I can only rate 3 stars. Even so, make a nice addition to the bedroom with the unexpected high back. Reasonably comfortable as a bedroom chair but I wouldn't want to sit at the dining room table on it for long periods. Chair came in perfect condition. I love it! Is beautiful and perfect accent piece on my living room. "Are the legs removable? I ask because I would like to take just the legs to be refinished in a different color. " "The image of this chair lists the width at 21". However, in the manufacturer specs it is listed at 24". This is a very crucial measurement for me. Which is the correct chair width?" Assembled dimensions: 47 in. H x 24 in. W x 28.3 in. D Seat dimension: 22.2 in. W x 18.3 in. D x 19.9 in. H We apologize for any confusion we might have caused. Goes perfect with the other items to make a gorgeous dining room: Safavieh Handmade Dip Dye Green/ Ivory Grey Wool Rug (9' x 12') and the Kosas home Nova Chairs & Winfrey Dining Table. Safavieh En Vogue Dining Bacall Antique Brown Dining Chair - 24" x 28.3" x 47"